Geographical Region: They are found from Virginia to Florida, west to New Mexico, and south to Brazil. Size: From 5 to 12 inches with females larger than males. Habitat: They like calm waters like ponds, marshes, and lakes with soft bottoms and dense vegetation. Food: Carnivorous when they are young, more herbivorous when they get older. They eat earthworms, crayfish, chicken, fish, insects, and plants and veggies. 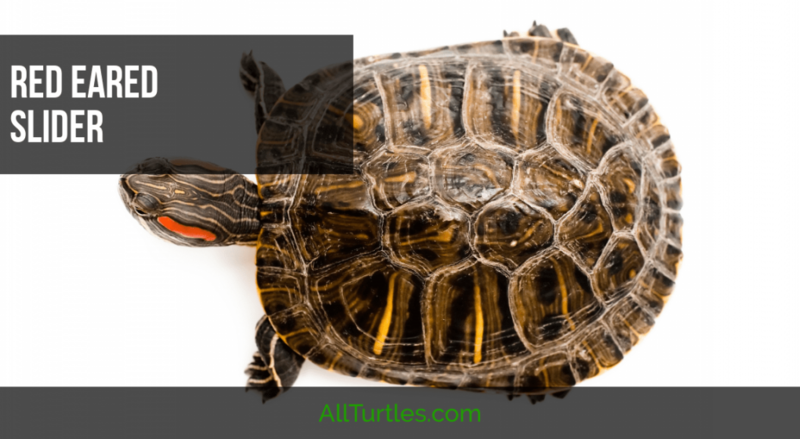 Interesting Fact: They are one of the most common pet turtles. What Next? Check out more cool posts below! 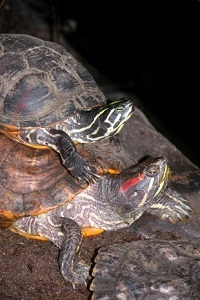 Red-eared sliders, also known as red-eared terrapins, are among the most popular pet turtles in the world. They belong to the pond turtle family, Emydidae, and species Trachemys scripta elegans. The red-eared slider is a medium-sized to large-sized freshwater turtle with origins in the southeastern United States. Their natural range is from Indiana to the north, New Mexico to the west, and the Gulf of Mexico to the south, though sliders have been introduced into the wild well beyond this range. Cared for properly, red-eared sliders can live a long and healthy life, surviving in captivity sometimes to 30 years. (Some have been reported to live into their sixties!) Inside this red-eared slider guide, you will learn everything you need to know to raise a healthy slider of your own. Like other turtles, red-eared sliders have a fused backbone and ribs that together form their shell. This armor consists of a top shell, the carapace, and bottom shell, the plastron, that are joined together by the bridge. The shell is further protected by keratinous scutes, the horny plates which give the turtle shell its smooth texture and distinctive pattern. Sliders, and other turtles, don’t have any teeth. Like other reptiles, birds, and mammals, they breath air, though they spend much of their time in and near the water. Hatchlings cannot be reliably sexed, but mature male and female sliders can be differentiated by noting certain easily recognizable aspects of their physiology. For instance, male sliders are smaller than females, reaching only 6 to 8 inches long, while females can grow to 8 to 10 inches long. Males have longer tails and foreclaws than females do, and a cloaca that is located further from the body. The cloaca, which is common to amphibians, birds, and reptiles, is a single opening to the genital, digestive, and urinary tracts. A pet slider can be a fascinating pet to watch, and while they might not fetch the newspaper, they will beg for food. In the wild, red-eared sliders spend much of their time in the water. Except for places along the shoreline where they like to bask in the sun, red-eared sliders have little need for land. When approached, they nimbly “slide” into the water, safe from harm. 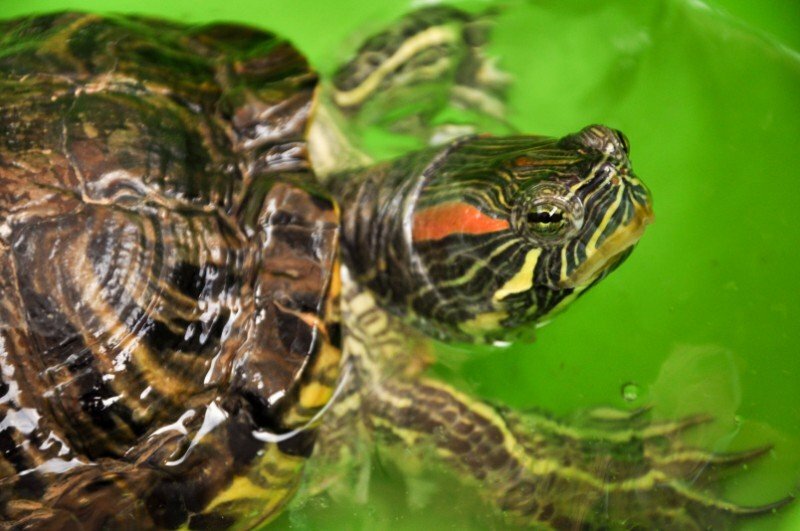 Red-eared sliders can be purchased from large-scale dealers, breeders, animal rescues, and from pet stores, both online and offline. Many of the sliders that are sold by large-scale dealers were raised in turtle farms in the southern United States. Regardless of the source, it’s always a good idea to do some research before purchasing your turtle. A turtle that has not been cared for properly could have health issues that may not become apparent until you get home, or it might die prematurely. You can improve your luck by examining the turtle first, preferably in the store (or breeder/dealer). Large-scale dealers will not likely know the histories of each and every turtle they sell since they handle so many. 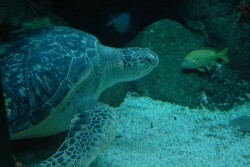 Likewise, unless a donor family has provided records, a rescue operation may not know anything about a turtle’s age, or whether veterinary records exist. Professional breeders will likely be the most informed, since they hatch the eggs themselves and keep records. Turtles that are sold by street vendors should almost always be avoided. If possible, try to inspect the environment in which the turtles are being sold. What you uncover here could tip you off to problems with their care that might adversely impact your turtle’s health. For instance, are the turtles overcrowded? Is their water relatively clean? Overcrowding and dirty water tend to go hand in hand. Are they active and alert? Are they being sold with other exotic species? In order to reduce the risk of disease transmission, turtles generally shouldn’t be paired with species from other continents. By law, pet store sliders should be no smaller than 4 inches long. However, due to a loophole in the law, which allows for the sale of turtles for “bona fide scientific, educational, or exhibition purposes, other than use as pets," this practice is somewhat common. Try to avoid these types of pet stores. Young hatchlings, while cute, are generally less hardy than sliders who’ve had more time to mature. Once you’ve determined that you actually have what you need to care for your turtle properly, and made certain that a responsible adult will be involved with its care (a turtle’s care should not be left entirely to a child without proper supervision), you should finally conduct a simple physical examination of the turtle you wish to buy. Healthy turtles should be inquisitive and alert. When approached, they should jump into the water from their basking site. For the physical exam, first pick up the turtle. Is it heavy? If not, the turtle may be sick. Next, gently pull one of its legs. A healthy turtle will react strongly, whereas the reaction of a sick turtle will be less vigorous. Examine the top and bottom of the shell. It should be hard, smooth, and free of any light or dark spots. Soft spots on the shell could indicate shell rot. Finally, note the presence of any open wounds. While a closed wound is fine, an open wound may require the attention of a vet. Collecting turtles from the wild may not be legal where you live. Because turtles produce relatively few eggs each year, the removal of an egg-laying adult female could be incredibly damaging to the success of wild populations. However, where red-eared slider turtles are not native, it may still be legal to collect them as pets. Call your state wildlife agency and review local laws to find out whether collecting one is legal. Keep in mind the fact that your slider breathes air, not water. So don’t bring one home in a container of water, where they could drown. Instead, simply place your turtle inside a small shoebox or plastic container that has been lined with a slightly wet material, such as dampened paper towels or shredded newspaper. Larger turtles might need more padding because they can bruise during transport. Your container should be securely covered with a lid and have air holes for breathing. Finally, be mindful of the temperature you will be traveling home in. In colder weather, you may want to consider double insulating your container with a Styrofoam box (with air holes) and warming it with heat pads. 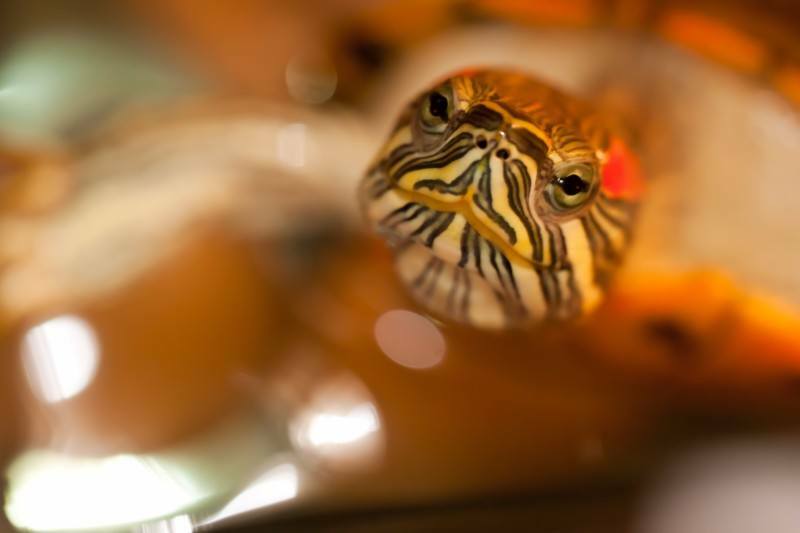 With the right set-up, red-eared sliders can be pretty easy to take care of. First, you need a tank. Compared to other aquarium creatures, red-eared sliders require a relatively large amount of space. They also need clean water, so expect to change their water and clean their filters roughly once a week. In the wild, nature keeps the water clean, but in a home aquarium, the responsibility will be yours. (By the way, it’s wise to assume that your child will not be doing this by themselves.) Finally, red-eared sliders are reptiles, so you will also need to provide them with basking lights, and possibly water heaters, to keep them warm. For many slider keepers, setting up your slider’s housing is one of the most satisfying, and creative, aspects of being a turtle owner. Try to create the most naturalistic habitat possible for your pet sliders. Not only is it more attractive, they’ll be happier and healthier if you do. Know, then, that in the wild, sliders live in a wide range of freshwater habitats, but they prefer relatively warm and quiet waters, such as ponds, lakes, swamps, and slow-flowing rivers. Beyond these, you should also have a way to monitor the conditions in your tank. In terms of the tank size, if you have a baby hatchling, you might need only a 1﻿0-gall﻿on tank to start. Your average adult slider requires no less than a 55-gallon tank. To put this into perspective, an aquarium that is 12-inches deep and 20-inches tall would need to be roughly 48-inches wide to hold 55 gallons of water. 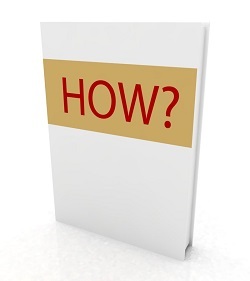 In the following sections, we’ll describe in more detail how to satisfy each of these requirements. Pet red-eared sliders can live in glass or acrylic aquariums, indoor ponds or outdoor ponds, and even fiberglass kiddie pools. 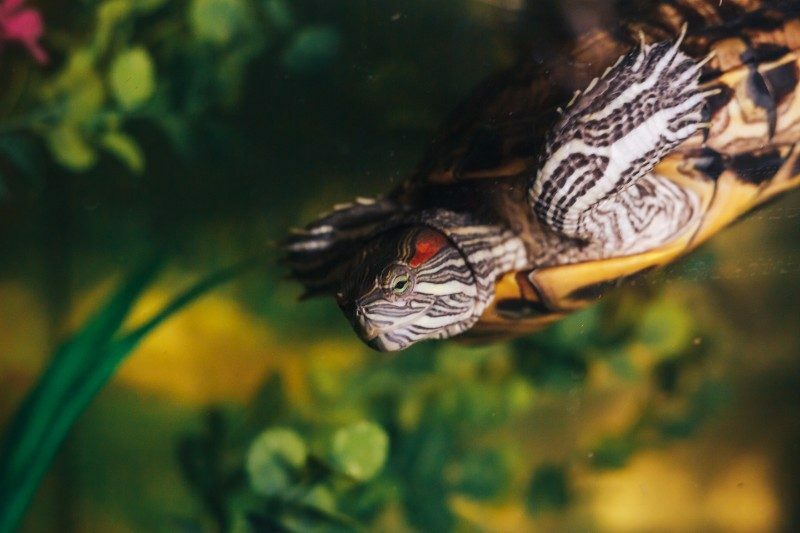 The viewing opportunities provided by glass aquaria and their ready availability at pet stores are probably why they are the most popular containers for housing red-eared sliders. Glass aquaria can be heavy and expensive. When buying one, be certain that you are buying an aquarium, which is designed to hold large volumes of water, and not a lighter weight terrarium. Glass and acrylic aquariums can also be placed on top of premade stands and fitted with screens that serve as lids. Slider keepers also sometimes house their turtles in livestock water troughs, known as stock tanks, made of galvanized steel or plastic. Steel tanks must be lined with a pond liner to prevent potentially dangerous metals from leaching into the water. Plastic tanks, on the other hand, do not require lining. Stock tanks are available at farm supply, home supply, and pet supply stores. Some stock tanks come with drains and plugs for easy draining with a rubber hose, but stands and screens are typically custom-made by handy keepers. If you do provide your own stand, be sure to design it to withstand the weight of the aquarium when full. (Expect a standard 55-gallon aquarium filled with water to weigh no less than 462 pounds.) Finally, storage totes, while sometimes used, are not recommended because they typically are not sturdy enough to hold large volumes of water and can melt when heated by heat lamps. A slider that has been provided with ample room to live and swim freely will behave much differently than a slider that has been deprived of this basic need. It’s best not to own a slider if these requirements can’t be met. You should expect to provide no less than a 55-gallon tank for an adult slider. For every additional turtle, add 10 more gallons of water. The surface area of your tank should be no less than 2 square feet for 1 turtle. Provide 1 additional square foot of surface area for each additional turtle. For larger females (>8 in), double these requirements. In terms of the depth of water in the tank, a useful rule of thumb is to make sure that it’s at least as deep as the turtle is long. In providing for your red-eared slider, do not underestimate the importance of the basking site. The basking site, or haul-out spot, is where your turtle will climb out of the water to warm itself, whether under a heat light or the sun. Basking allows the turtle to raise its core body temperature (remember that they are reptiles), which is essential for its digestion, metabolism, immune function, and shell health. Drying out the shell and skin also helps to prevent the growth of algae and shell rot. Basking sites are located at the water line, for easy access, and should leave no less than 2/3 to 3/4 of the available space in the aquarium for water. Place it under a reflector-type light fixture (heating and lighting is discussed in the following section). The basking site can be an island or platform, located at the water line, or it can be an island built up to the water line from the bottom of the tank. Pet stores provide all of these. The simplest types include either a smooth rock (partially submerged) or a float made of natural cork bark. You can also place a thinner rock on top of 2 bricks. Removable platforms can be placed on legs or onto 2 sets of silicone pegs that have been attached to the sides of your aquarium. You can be as creative or as utilitarian as you’d like, so long as the basking site is easy to access and won’t scrape your turtle’s shell. Cork is probably the most popular material to use. It’s relatively expensive, but it’s natural looking and non-abrasive. If you buy a platform, be sure to consider how easy it will be to take it apart for cleaning. You can also use rocks, but know that they do pose some hazards. Sharps rocks can scrape turtle shells, which can lead to infections. A turtle might also become trapped underwater by rocks that have somehow been knocked loose. Consider using a nontoxic epoxy or aquarium sealant to secure any rocks in place. For a more utilitarian approach, it’s possible to construct basking platforms out of PVC pipes, plastic egg crates, and zip ties. Unattractive as this may seem, it may be a more economical way to customize your design. Will it be easy for your turtle to climb onto? Does it take up too much swimming space? Is it natural looking or otherwise attractive? Will you be able to place it beneath your heat lamp? When you care for a turtle indoors, you need to replace the sun’s natural heat and light. If the temperature of your room is already relatively warm (75 F), you can warm your turtle’s living area with a simple reflector-type light fixture fitted with a 60-watt, 75-watt, or 100-watt ultraviolet-B (UVB) bulb. Position the light above your turtle’s basking area, and keep it on for 12 to 14 hours a day. If nighttime temperatures fall below 65 °F, leave the light on at night. Use an aquarium thermometer to monitor the temperature of the water and the basking site. Keep the temperature of the water between 76 to 84 F and the basking site between 82 to 88 F. If the temperature becomes either too high or too low, simply adjust the wattage of the bulb or the height of the light fixture. Besides providing your turtle with heat and light, the light from a UVB bulb will help your turtle to synthesize vitamin D3, which it would otherwise receive from the sun. Vitamin D3 helps your turtle’s body absorb the calcium it needs to build a strong shell and bones. In cooler rooms (<75 °F), you’ll need a submersible water heater. Use an aquarium thermometer to calibrate and maintain the temperature of the water—do this before you add your turtle. Always rely upon your thermometer to calibrate the water in your tank, not the heater’s precalibrated settings. The heater’s settings may not always be correct, and if the device fails, the thermometer is there to tell you. Finally, buy a heater that is encased in plastic, or be sure to place it where your turtle won’t accidentally break it. A light fixture can be hung over the aquarium, or clamped onto it, but make certain that it cannot fall accidentally into the water. Use a screen to help prevent this from happening. You should also strongly consider connecting your electrical appliances to a ground-fault circuit interrupter (GFCI). Use of a GFCI helps to prevent you from electrical shock by shutting off the electrical circuit when the interrupter detects a power leak. Keeping the water clean is one of the most important tasks that any turtle owner faces. It’s easy to do, but it must be done every week to four weeks, depending on the size of your tank and the performance of your filter. If your water is looking grimy, you should change it. You can also use a water testing kit to measure the nutrient levels in the water. No matter what kind of setup you have, the procedure for changing out the water is pretty straightforward. If you have a small tank, remove your turtle and any accessories, pour out the tank water, wipe down the tank walls with paper towels, and refill. If you have a large tank, use a siphon or mechanical pump, such as a pond or utility pump. Pump types vary. Pond pumps are convenient because they can be placed directly into your tank to pump water through a hose. If you have a particularly dirty tank, or a sick turtle, you can also clean your tank with a mild detergent (or a 5-percent bleach solution). A filtration system will go a long way to helping to keep your water clean. Whatever type of filtration system that you use, you’ll need to clean it weekly to monthly, or whenever you change the water. Filters clean water in one of three ways: mechanically, biologically, or chemically. With mechanical filtration, the largest pieces of debris are simply filtered out. Biological filtration works by creating surfaces that encourage the growth of beneficial nitrifying bacteria. These bacteria turn toxic nitrogen waste into less harmful byproducts. Chemical filtration usually involves activated carbon. Activated carbon filters remove some of the organics from the water but can lose their effectiveness pretty quickly. Canister filters are the best filters you can buy, but they’re fairly expensive. Aquarium owners like how much filter media they hold (compared to in-tank filters), the fact that you can hide them beneath your tank, and their relative lack of noise. There’s a learning curve to using them, but once you get the hang of it, they’re said to be the best. They can also be set up to promote better water flow in your tank. If you’d like to save money, you can also make your own tote filter. 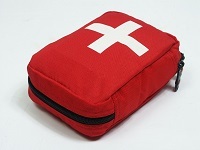 You’ll need a number of supplies, including your own mechanical and biological filter media. Foam pads make suitable mechanical filters, and there are number of options for biological filter media, such as bioballs or lava rock. Once acquired, you can supposedly set up a tote filtration system in under an hour. Plants help you to create a more natural-looking home environment for your turtle. They can also provide your slider with good hiding places, which is good for your slider’s mental health. Unfortunately, live plants won’t last long. Your slider will tend to dig them up or eat them. If you’d like to grow plants for your slider to eat, you can do so. Sliders eat aquatic plants, such as water hyacinth and anacharis. A less costly approach is to use artificial plants. You’ll find that there are plenty of realistic looking choices, generally in plastic or silk, that will last longer in your tank. Red-eared sliders are opportunistic omnivores. In the wild they’ll eat just about everything they come across, but as adults they eat mostly plants. Pet sliders should be fed a similar diet. Feed hatchlings and juveniles every day and adult sliders every other day. The trick is to feed them only as much as they need, and will eat, because any uneaten food will tend to dirty their water. A good rule of thumb is to offer your slider an amount of pellets that is roughly equal to the size of their head. As aquatic turtles, sliders spend most of their time in the water, and that’s where they like to eat. To cut down on the mess, you can place your turtle in a separate container along with their food and a few inches of aquarium water. Once finished, toss out the dirty water. Commercially available pellets should be the staple of your slider’s diet. They’re specially formulated to meet your slider’s dietary needs, and can be supplemented with a variety of different foods. Feed them an assortment of fruits, vegetables, and proteins two or three times per week. The amount of proteins they should eat depends on their age. Hatchlings and juveniles require considerably more protein than adults; adults need more plants. If you’re providing them with an age-appropriate commercial feed, along with assorted proteins, leafy greens, fruits, and vegetables, you need not worry so much about the details of what you’re feeding them. Some foods, however, should be avoided. These include raw meats from the grocery store and processed meats, such as hot dogs. Sliders cannot eat fireflies, chocolate, avocados, or onions. In general, you want to avoid all processed foods, except for those that have been made especially for aquatic turtles. Amphibians and reptiles, such as turtles, are frequent carriers of the Salmonella bacteria. Salmonella bacteria cause salmonellosis in humans, a gastrointestinal disorder that can lead to fever, diarrhea, abdominal cramps, and sometimes vomiting. In rare cases, Salmonella can even spread to your blood, bones, and brain. There is no way of telling, simply by looking at it, whether your turtle has the salmonella bacteria on its body or not. In 1975, after a rash of salmonella outbreaks among children, the U.S. Food and Drug Administration (FDA) began regulating the sale of turtles with carapace lengths less than 4 in long. The best way to protect your family from the possibility of infection by Salmonella is to wash your hands thoroughly any time you handle a turtle. Do this immediately after handling one, taking care not to touch your mouth before washing your hands. Young children are at greater risk of developing complications from Salmonella infections because their immune systems are not fully mature, and they’re also more likely to put their hands in their mouths. The Center for Disease Control and Prevention (CDC) actually recommends not even owning a reptile or amphibian if children under 5 years of age are living in the home. If children are around, and you own a turtle, make sure they’re washing their hands. The buildup of algae on your turtle’s shell can hide injuries or infections that may need to be addressed quickly. You can remove some of the algae on your turtle’s shell by scrubbing it periodically with a soft toothbrush and room-temperature water. Swollen eyes may indicate the presence of a respiratory infection, which is treatable with antibiotics. Less often, a lack of vitamin A in your turtle’s diet will result in a condition known as hypovitaminosis A. With a properly varied diet, this should not be a problem. Shell rot is caused by infection of your turtle’s shell by both fungal and bacterial organisms. It can result from scratches to the shell, such as from basking site rocks, or due to improper husbandry conditions that have weakened your turtle’s immune system. Lack of a proper basking spot, heat source, or clean water can put your turtle at risk for this disease. Shell infection can spread throughout a turtle’s body, so it’s important to address it quickly. Shell rot most often appears as a light spot on your turtle’s shell. If your turtle’s shell becomes infected, see your vet. Your veterinarian may recommend daily treatment with a broad spectrum topical antiseptic, such as povidone iodine. In severe cases, the shell may break off in pieces and give off a foul smell. Depending on the severity of the infection, your vet may recommend a routine of lightly scrubbing the infected area and applying an antiseptic. 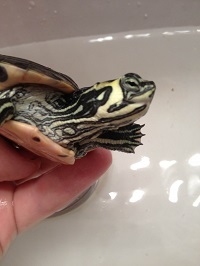 If your turtle cracks its shell, you can temporarily rinse the shell with saline and apply povidone iodine. Next, cover the treated area with sterile gauze, and consult your veterinarian. Injuries that go untreated can result in abscesses that are filled with a semisolid discharged called caseous. Such injuries can occur anywhere on your turtle’s body. If you find one that does not go away within several days, you may want to see a vet. If your turtle has a runny nose, watery eyes, decreased appetite, or has become inactive, it might have a respiratory infection, such as pneumonia. 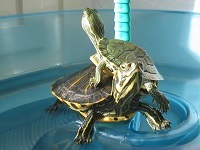 Sick turtles may appear to swim lopsided because their normal sense of balance has been thrown off by the congestion. First double-check the temperature of the water in your tank, then talk to your vet. Your vet may recommend X-rays, antibiotics, and keeping the water in your tank at a higher temperature. The sale of turtles under 5 inches long is prohibited by law except for “bona fide scientific, educational, or exhibition purposes, other than use as pets.” Be mindful of the law, and the risks involved. Private breeders are typically interested in producing valuable morphs, such as albino red-ears and pastels with varying degrees of yellow and red coloration. To breed sliders, you’ll need to bring together a healthy and sexually mature pair of male and female sliders. Male sliders mature around three and one-half years old. Female sliders mature around four and one-half years old. You can encourage breeding by placing your turtles in a cool room (50 to 60 °F) during winter and reducing the light over their basking area to ten hours. Keep them there for 6 to 8 weeks to give them ample opportunity to mate. Once the 6-week to 8-week period is over, you can return them to normal temperatures. The female will lay eggs from spring to summer. Some breeders will remove the female turtle to a new enclosure containing a foot or so of soil or peat moss, where she will lay her eggs. Breeders know when she’s ready to lay because she will often stop feeding and become somewhat hyperactive. If she’s ready to lay, once placed in her new enclosure, she will do so in couple of days. A red-eared slider will typically lay 4 to 10 eggs (a clutch) every 2 to 4 weeks during the breeding season, resulting in a total of 5 to 8 clutches. The eggs are incubated by placing them on top of moistened vermiculite at 80 to 82 °F. Spray the vermiculite with water periodically to keep it moist until they hatch, normally in 55 to 65 days. Turtles are some of the longest living pets you will find. It’s perhaps not surprising that, over time, some people find that they can longer care for their slider. Should you find yourself in this position, here’s what you can do. First of all, do not release your pet into the local pond. In many places, it is illegal to do so, and your slider could do lasting damage to the pond ecosystem. A better option is to take responsibility for finding a suitable home for your slider to live. For instance, you can take your turtle back to the pet store you bought it from. They might even buy it back from you. Contact your local herpetological or turtle societies and find out if they’ll take your slider. You can place adoption ads in your local pet store or with your vet. Check with your local humane society as well. If they can’t take your pet, they might refer you to someone who will. Finally, check with family and friends. In all cases, carefully screen any potential adopter, making certain that they fully understand the responsibilities involved and are ready to look after your pet. Smith, Katrina. Red-Eared Sliders. Neptune City: TFH Publications, 2011. Vosjoli, Philippe de. Red-Eared Sliders. Singapore: Advanced Vivarium Systems, 2001.